As we roll into 2018, we like to look back at the greatest trucks from the past year. 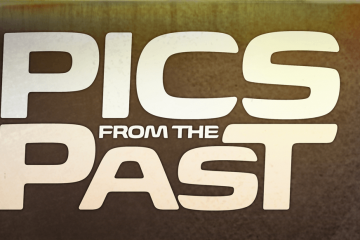 When we sat down to make our list, we weren’t surprised that many of the best were classic trucks. The scene shifted in that direction quite a few years ago, and it doesn’t look like things are going to change any time soon. We like modern trucks, but I think we can all agree that some classic creations are stunning. Though there are many shows throughout the year that bring out fresh rides, none compares to the annual SEMA Show. If you look at our picks for Truck of the Year, most of them debuted at last year’s show or were at SEMA 2017. The show has a huge impact on the scene thanks to the top-name shops and customizers that participate each year. 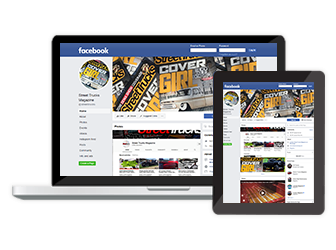 As we’re writing this, SEMA 2017 is over, and we can tell you that once again we were impressed with the turn out. The show is usually the top of the mark for the truck scene, with others like a few Goodguys events and Lone Star Throwdown right behind. Fall is the greatest time of the year, and the best part is that cooler temperatures are much more pleasant for checking out trucks than the heat of summer. Weeding through trucks for our list was tougher than ever thanks to folks going to extremes with bigger wheels and more power packed under the hood. Attention to the smallest details is the current norm, with special focus paid to body mods and evenly spaced gaps between body panels. At the other end of the spectrum, patina trucks with just the right amount of wear are making a big impact. With the drive for increasingly precise and extreme modifications many companies are coming to our rescue by developing parts to make our jobs easier. In years past, we would take the liberty of picking the Truck of the Year ourselves. Last year, we let our readers decide which truck they thought was the best. This worked well, so we’re appealing to you again. 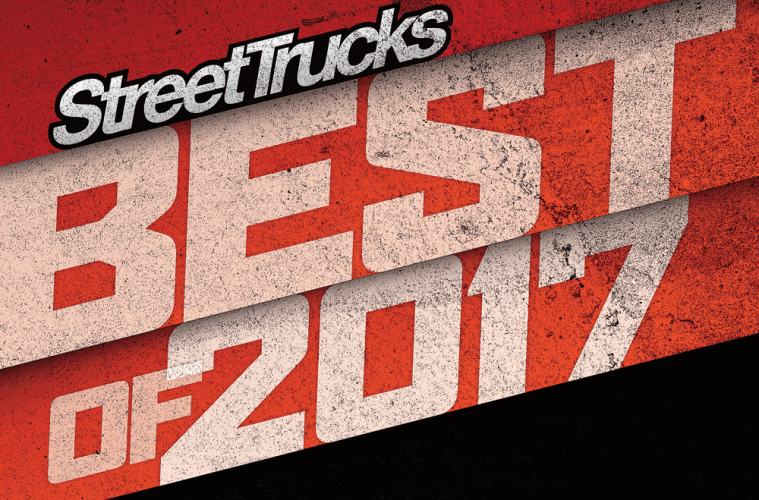 Check out our website, Streettruckmag.com, where you can vote for your favorite truck of 2017. After voting ends on Jan. 23, 2018, the winner will receive a custom billet award made by Philbuilt Designs. For all other details and rules, you can refer to the post on the site. 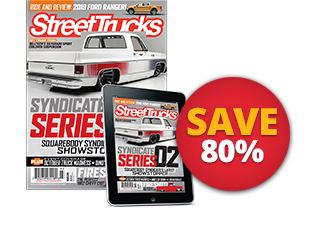 For now, check out our picks for the Top Feature Trucks, Best “Blood Sweat & Gears” and Mini-Truck of the Year. 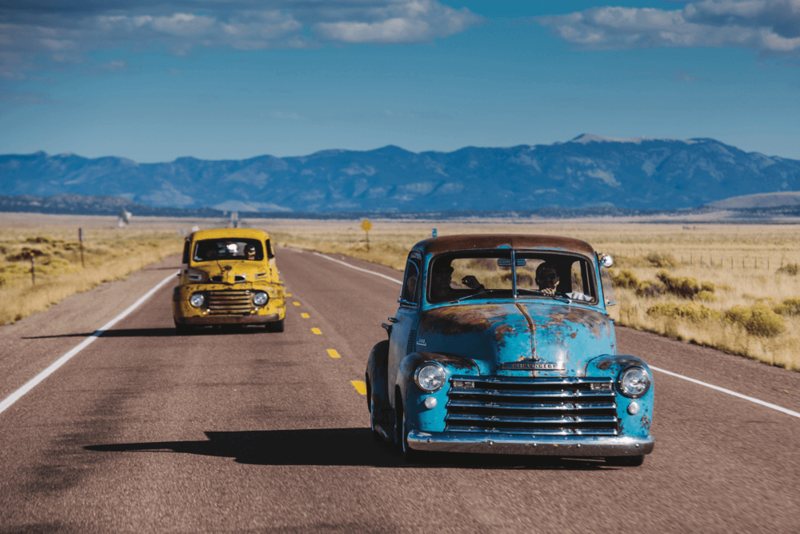 Though KC Mathieu spent years working for Gas Monkey Garage (GMG) and was on the “Fast ‘N’ Loud” TV show, he maintained a paint business on the side. When he decided to retire from GMG, it was full steam ahead with KC’s Paintshop. Since then, the business has expanded, and KC offers more services these days. To represent this, the crew built these two trucks and drove them to and from SEMA.That’s nothing short of badass! It takes guts to buy a brand-new truck and immediately drop it off at a custom shop for heavy modifications. 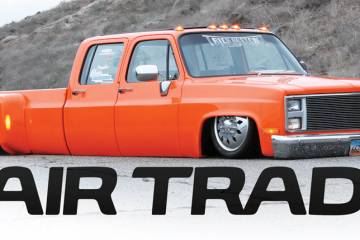 That’s exactly what happened with Masen’s truck when he took it to Nfamus Metal Fab to be body-dropped over a set of 26×10-inch Raceline billet wheels. The best part about this truck was that Masen’s family bought and built it as a 16th birthday surprise for him. Some kids have it all. Some C-10s are built out of a box, but this truck was definitely not one of those. Terry and Sara trusted Strange Motion with the family’s pickup and the results were simply amazing. Tim Strange went all out with the chassis making it pro-touring ready with a tubular inner structure and suspension components from Scott’s Hotrods ‘N Customs. The body is a real stunner as it was completely streamlined and then covered in a sweet blue pearl. 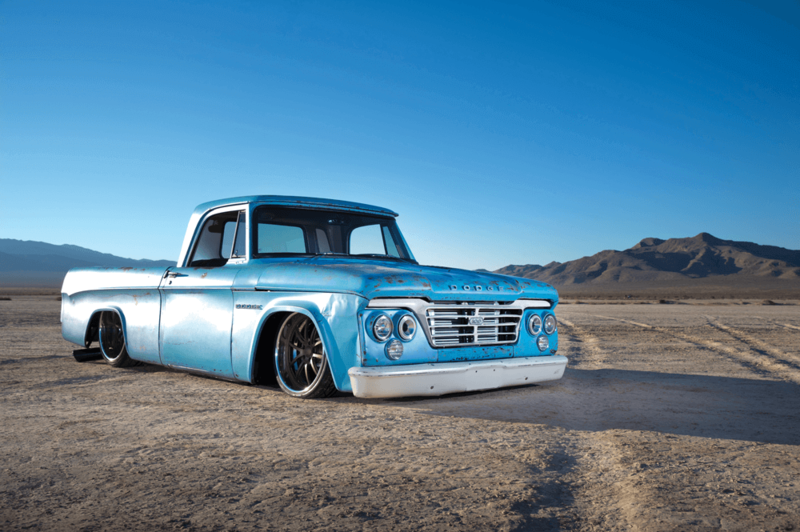 Fat Fender Garage specializes in building F-100s, but Keith Rozelle had faith that Jason Noel and his team could complete this truck for SEMA. Keith admits he was a mini-trucker but always had a sweet spot for 1967-72 C-10s. Keith picked up this truck as a clean driver and originally decided to just airbag it to get the frame on the ground. One thing led to another and it turned into a full-blown rebuild. Though he didn’t intend to go all in on the truck, Keith is pleased with the outcome. Who wouldn’t be? Blake Stoner is a newcomer who has quickly developed a reputation for building sick patina trucks. This time around, he started with a barn-find pickup and rebuilt the entire engine and suspension, leaving the body completely alone. 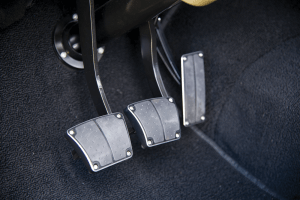 The suspension was designed to lay the running boards while tucking a set of 22-inch Detroit Steel wheels. Blake dropped in a 6.0L LS engine to throw smoke from the rear tires and almost caught the truck on fire while doing donuts before our photo shoot. The redesigned Boss Custom Interior is the cleanest part of the build. 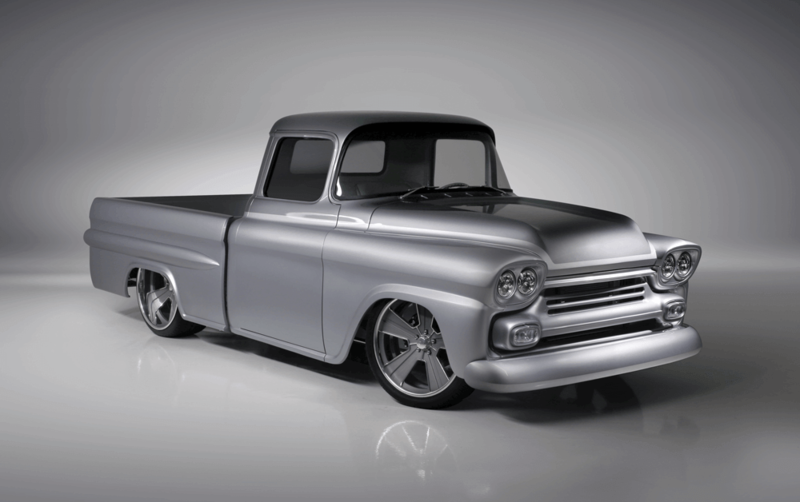 Once finished, the truck was hauled to the SEMA Show where it won a coveted Chevrolet Design Award. Unibody trucks are an uncommon sight, but they look damn good planted on the pavement. 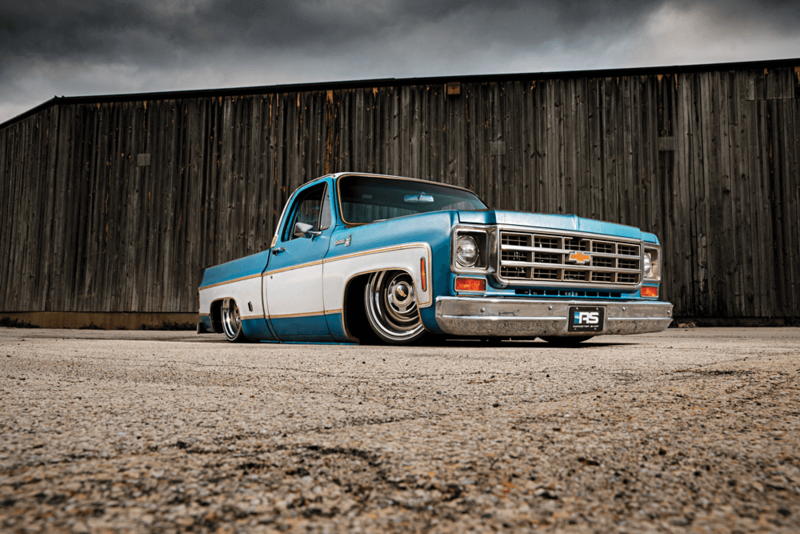 To get this truck on the ground, it was equipped with Porterbuilt suspension and then shipped off to Jason Graham in Portland, Tennessee, where it was transformed into a rolling piece of art. A modern Ford Coyote engine powers the truck. 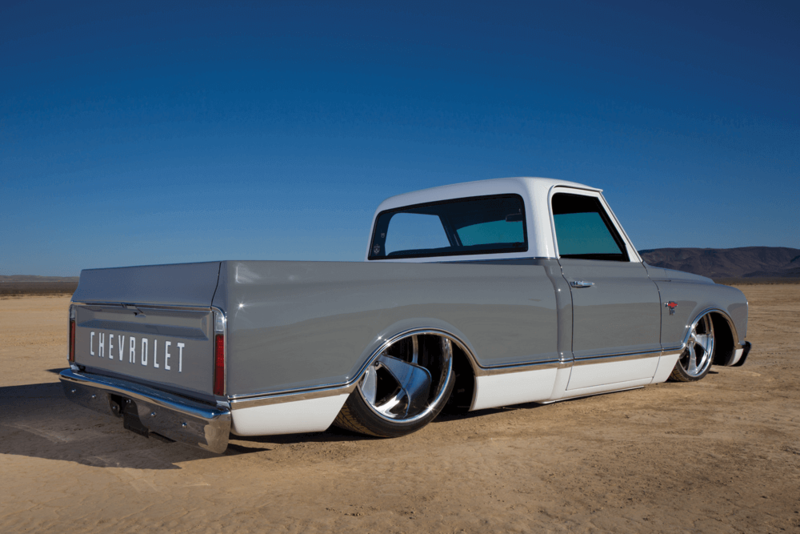 Todd’s truck was well received and took home the Goodguys 2016 LMC Truck of the Year, Late. Building a show-quality vehicle is one thing and creating a full custom creation is another. The brainchild of Rich Tillema and Sic Chops, this vehicle represents something that never was. Making it all possible, the team started by shortening a Carryall, chopping the top, adding some new lines and massaging the body smooth. 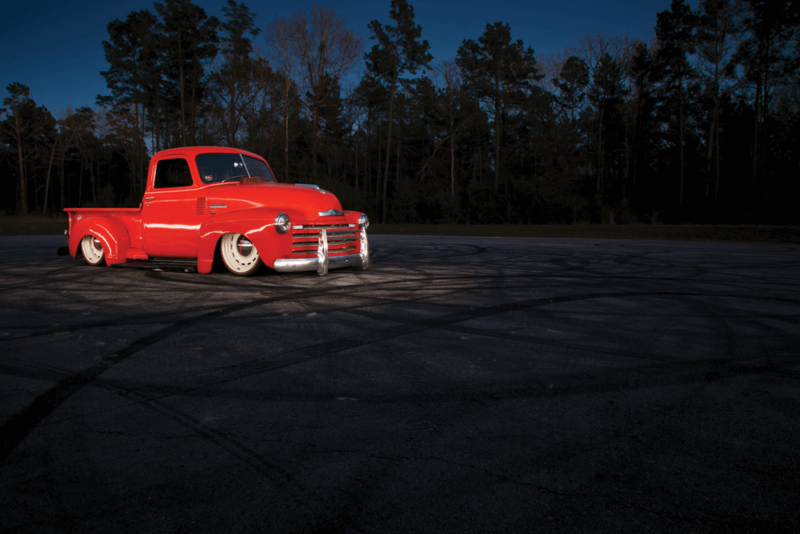 On top of that this truck rolls on a Roadster Shop chassis and is powered by a GM LSA engine from Don Hardy Racing. Rounding it all out is an interior done by Ron Mangus. This truck is on a level of its own. 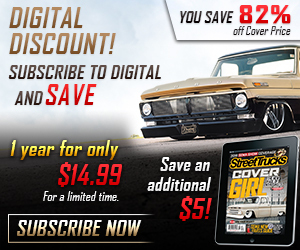 When the Roadster Shop decided to develop a Spec Series chassis for 1973-87 C-10s, part owner Phil Gerber was more than willing to purchase a truck on which to base the prototype system. Phil found a truck that had the right amount of patina and slid the computer-designed chassis underneath for testing. It was also equipped with a GM LQ9 engine from Texas Speed and Performance so he could rip loose whenever he needed to release some stress. Perfecting the look, The Roadster Shop developed these OE-1 wheels with Forgeline. Phil loves this truck so much that it became his daily driver. You gotta grab them while you can. 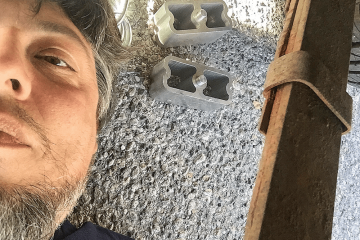 Ralph Holguin of RMD Garage learned this lesson when he thought he’d missed out on purchasing this truck. 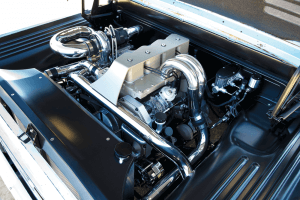 His talented team rolled a Total Cost Involved coil-over chassis underneath to set the truck low and to handle the power of the GM LS3 engine. The crew also cleaned up the classic steel using nothing but original materials. Then, the team redesigned the interior to meet the standards of a modern luxury vehicle. The truck also made its big debut at the RMD Garage show on the Velocity Channel where viewers got to witness the transformation in the comfort of their own homes. Yes, there was a time when C-10s weren’t everywhere in the scene, and this truck was first built during that time. Clint Petree started the project when he brought the truck to Grant Kustoms for custom metalwork. Grant tastefully modified the body to sport side lines from a 1969 Camaro and added a subtle chop top. The rest of the truck was reformed to create a one-off look. 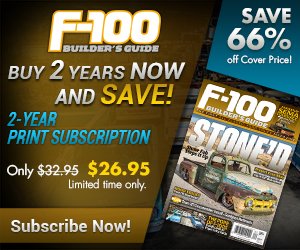 After making its debut almost a decade ago, the truck languished and was never finished. 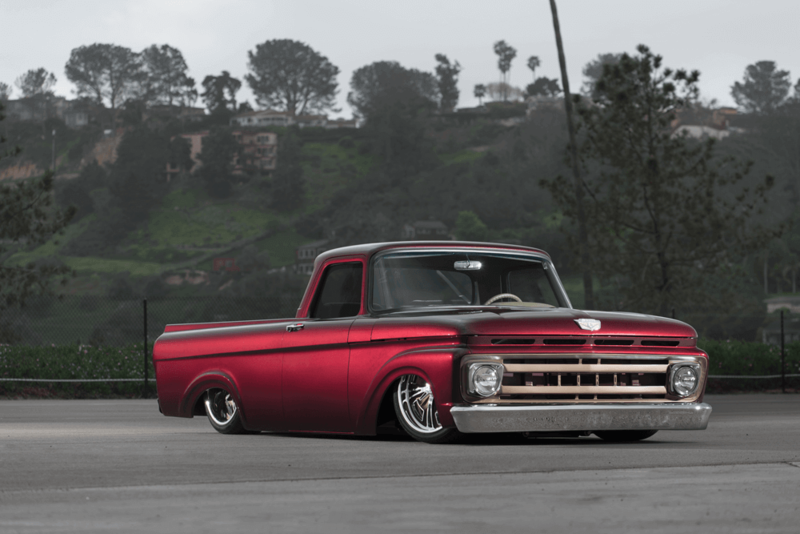 Nick Germano of Outkast Kustoms took over the build and made a few changes, like transplanting an LS3 engine, bolting up Intro billet wheels, finishing the interior and coating the truck in toner red with chrome details. 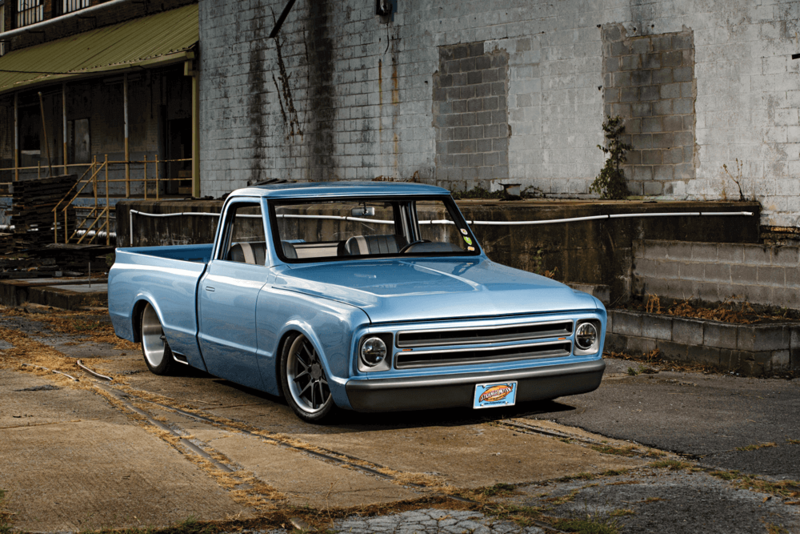 This isn’t just another C-10. 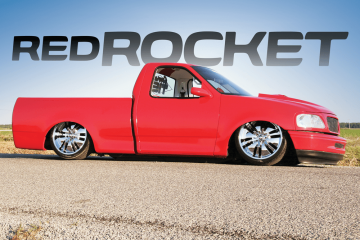 It’s a piece of history that paved the way for C-10’s to become the powerhouses of the scene that they are today. Kate was tired of watching her husband reap all of the glory with his own trucks; she wanted one of her own. Since her husband Mike realizes that a happy wife makes a happy life, he found the perfect truck for Kate to call her own. Proving that sometimes it’s better to start with someone else’s old project truck, Kate’s truck was already ‘bagged and body-dropped when she got it. 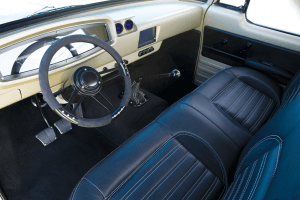 To complete the job, the interior was redone and the exterior received an old-school mini-truck paint job. Though The Custom Shop helped out, Kate got her hands dirty during the build process. Now she has an envy-inducing ride that she’s proud to call her own. 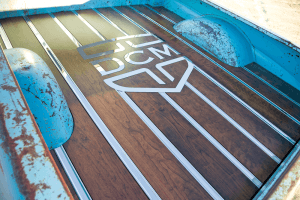 Backed by his father at DCM Customs, Todd Flokstra is a young customizer with a strong skillset. 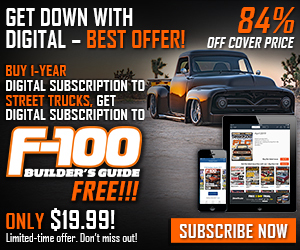 When the shop got a call from a local junkyard about a ’62 Dodge that was up for grabs, Todd jumped all over it and saved the truck from destruction. Instead of simply restoring it, Todd decided to flex his skills and laid it flat on the ground. Just for kicks, he also fitted the Dodge with a 4BT Cummins diesel with a compound turbo setup. This franken-truck caught our eye because it was one of the coolest patina-sporting trucks we’ve seen all year.